Description: Slender, aquatic or dry-land perennial. Culms weak, filiform, leafy, submerged and elongated or creeping and procumbent or erect and tufted and to 10 cm high. 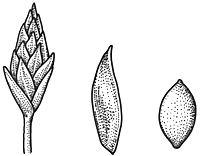 Spikelets solitary, elliptic in outline, strongly flattened, 5–10-flowered (rarely to 15 flowers), 3–5 mm long; involucral bract shorter than to slightly exceeding spikelet, glume-like or with a short thickened appendage. Glumes obtuse, conspicuously numerous-nerved, 1.7–2.8 mm long, straw-coloured with red-brown patches. Stamens 2 or rarely 3; anthers 0.5–1.0 mm long. Style 2-fid. Nut plano-convex, with angles not well-defined, broad-obovoid to ellipsoid, half to three-quarters as long as glume, 1.4–1.8 mm long, c. 1 mm diam., smooth, minutely reticulate, shining, grey-brown to dark brown. Distribution and occurrence: Grows in swamps and streams; scattered along coast and tablelands.